A veteran, his family, friends, and neighbors are making an impassioned plea to whoever stole an American flag that holds much sentimental value to a man who served his country with distinction. Kim Phillips, who also resides in Tacoma, is helping out veteran Nolan Gomez recover the flag. She shared that Gomez was just doing some yard work when someone stole his flag. The flag usually has a special place on the back of Gomez’s truck, but at that time he took it down while he used his truck to do some work. He temporarily stood the flag up in a cone. Phillips said the flag was very important to Gomez, and as someone who also comes from a family of military men, she feels strongly for Gomez. 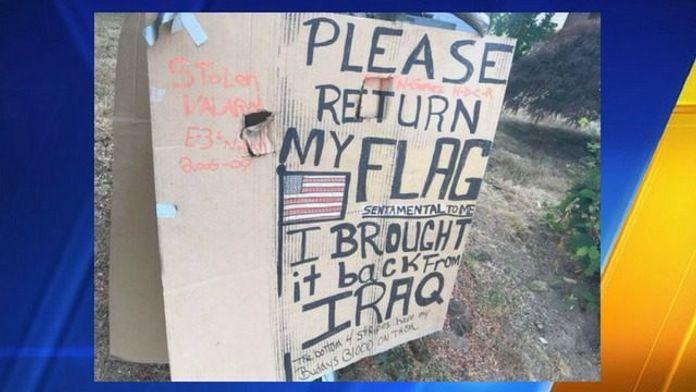 She helped make the sign hoping that whoever took the flag would take heart and return it. Her neighbor took a photo of the sign and posted it in a Pierce County community page. It has been shared hundreds of times. The support of the community and other strangers has been overwhelming, with other families even offering their own American flags to Gomez. Phillips said that they are touched that something incredible can come out from something so heartbreaking. Still, they are hoping to recover the flag. Some reacted on social media and blamed leftists for the missing flag. He's lying. Nobody dies 'on the American flag's during combat. And desecrating the flag by bleeding on it is punishable by death, so his friend got what he deserved. The Iraq war was actually a violation of the Geneva Convention, meaning it was a WAR CRIME, so he doesn't deserve the flag. It's a symbol of his cowardice, going into an innocent nation and helping to murder hundreds of thousands of innocent people. Nobody actually'supports the troops', even though they say it to sound patriotic. In reality, the troops are all uneducated idiots who don't deserve any respect at all.